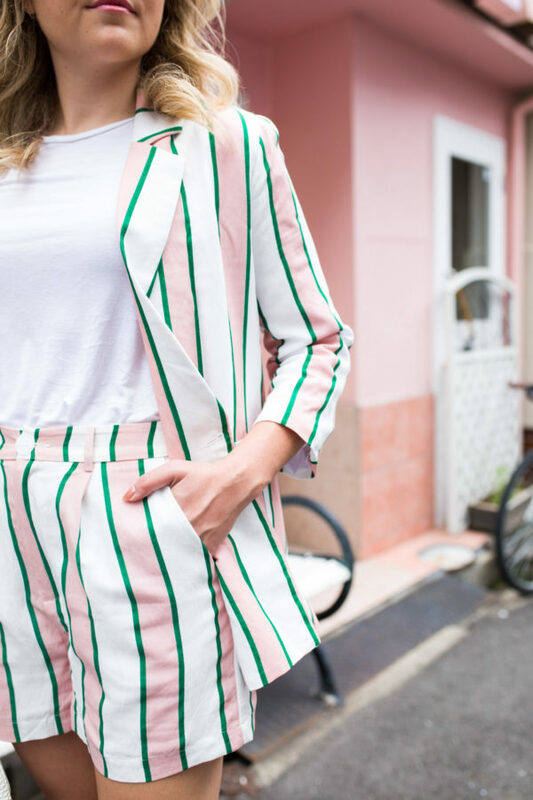 My love for matching sets knows no bounds lately, so I’m sure you can imagine my excitement when I found this oversized blazer with coordinating shorts in this cute pink and white (and green) striped print. It’s the perfect short suit! I’m no stranger to wearing a blazer with shorts (this outfit is still one of my faves! ), but I love the look even more when it’s matchy-matchy. I’ll be sharing our full Japan itinerary soon, but Osaka was one of our new destinations this time around! I wore this short suit set with pink sneakers for a day of exploring the “hipster neighborhood” of Nakazakicho. Lots of little alleyways filled with cute coffee & cake cafes, tiny storefronts, and vintage shops, too. But word of advice when you’re planning your day… Most everything in this area opened around noon! Hope you’re not sick of seeing this bag yet… I’ve been wearing it on r-e-p-e-a-t lately. From Coachella to Japan, it’s been my go-to. I love the little round shape (it surprisingly holds a lot!) and the removable (and adjustable!) crossbody strap. The white color is so versatile since it’s embossed (goes with everything! )… I know I’ll be carrying it over and over and over this spring and summer. PS: You can peep more of my everyday outfits from the last few weeks here! Okay, I’m obsessed with this set! The colors, style, etc. I love how you can mix and match the two with different looks. I may need to pick this up! I can’t believe how cute this suit is! You look absolutely adorable in it! This outfit is seriously amazing! I am obsessed with the stripes and colors! Obsessed! What size did you get in the blazer? I need to order this straight away!